Three terms come up again and again… but what do they mean? The sloper is a basic pattern cut to a standard size from a table of standard body measurements. It contains all the necessary information about the shaping, contour seams, and ease that will make the sloper fit a particular size. It has no fullness, design details, or seam allowances. It is used as the basis for creating new designs. Basic block patterns are drawn to the exact measurements of a person … These patterns should fit the figure perfectly when the darts are taken in. Margolis doesn’t use the word block; instead she talks about personalised slopers. Then again, Harriet Pepin in Modern Pattern Design uses block, sloper and basic or foundation pattern interchangeably. Confusing? Just a bit. The key words here are standard vs. personalised. The BurdaStyle blog featured a number of basic, generic sloper patterns in a recent post. These are great if you’re generic… but who is? Seems to me it’s worth investing the time to customise from the very start rather then start with something made for that mythical ‘average’ figure and modifying it. Final definition: what’s a pattern? 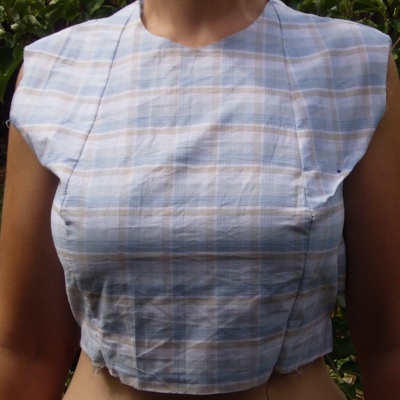 Well, a block/sloper is used to make a pattern, and a pattern is used to make a garment. A pattern has all the information to construct a particular design – seam allowances, notches, darts, ease for design or comfort. Patterns are also made of lightweight paper or tissue, whereas blocks/slopers are templates placed on heavier card for longevity. Patterns are the point of the whole exercise!